The 5th ILGA Asia Conference's opening plenary featured keynote speeches from Gloria Careaga and Renato Sabbadini, ILGA Co-secretaries General, Ms. Anjana Suvarnanada of Anjaree and Mr. Kittinun Dharamadhaj, president of Rainbow Sky Association Thailand. Also present during the opening ceremony is Dr. Taejing Siripanich, Commissioner of the National Human Rights Commission of Thailand. The first plenary session consisted of reports on the role of ILGA in the global and regional LGBTI movements, situationer on women, trans and intersex persons. 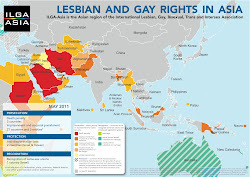 Twenty Asian country reports on LGBTI rights movement situation were presented, as well as a Pan-Africa ILGA situationer. The countries include India, Nepal, Sri Lanka, China, Taiwan, Mongolia, Hong Kong, Cambodia, Japan, Singapore, Indonesia, Malaysia, Philippines, Thailand, Burma, Bahrain, Macau, Vietnam, Palestine, Lebanon. The 5th ILGA Asia conference is a testimony to the commitment and strength of LGBTI persons and groups to eradicate discrimination and violence against LGBTIs and to achieve equality for all, regardless of race, class, religion, sexual orientation and gender identity. ILGA regional conferences provide opportunities to engage in the most relevant experience sharing and effective strategizing with partners all over the region. As Asia is the biggest, the most populated and most diverse region in the world, the preciousness of this opportunity becomes even more evident…Let's celebrate then the new rising of the sun of ILGA Asia and its sweet promise of a better world for all! Welcome to Bangkok and to the 5th ILGA Asia Conference! การประชุมอิลก้าระดับภูมิภาคเป็นโอกาสที่จะร่วมแลกเปลี่ยนและรับฟังประสบการณ์ตรงและยุทธศาสตร์ที่มีประสิทธิภาพจากทั่วทุกพื้นที่ในภูมิภาค และเนื่องจากเอเชียเป็นภูมิภาคที่ใหญ่ที่สุด มีประชากรมากที่สุด และมีความหลากหลายมากที่สุดในโลก คุณค่าของโอกาสในการมาพบกันนี้จึงยิ่งทวีความสำคัญ พวกเราจงมาเฉลิมฉลองฟ้าใหม่ของอิลก้าเอเชียที่มาพร้อมกับโอกาสอันแสนหวานที่เราจะสร้างโลกที่ดีกว่าสำหรับทุกคนกันเถิด!